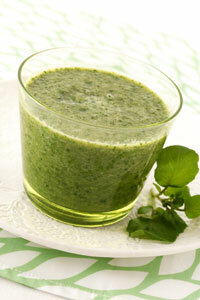 As with watercress, pomegranate juice is rich in antioxidants. Studies show that it can help prevent heart disease and has anti-inflammatory and anti-bacterial qualities – so grab the blender and get whizzing up this super green treat. 1. Peel the Sharon fruit and roughly chop. Place everything in a blender and whizz together.